FULTON, NY- The employees of National Grid recently completed their workplace campaign in support of the United Way of Greater Oswego County. Community and Customer Manager for National Grid Walter Dengos (left) presents Executive Director of United Way of Greater Oswego County Patrick Dewine with a check representing the result of National Grid’s employee workplace campaign and its corporate support of United Way’s Annual Campaign. Employee donations of more than $4,000, combined with a corporate match from National Grid, resulted in a $9,708 donation to United Way’s 2016-2017 Annual Campaign. National Grid annually supports United Way through its workplace campaign that allows employees to donate and/or volunteer their time for a worthy cause. National Grid has been a United Way partner for several years and is a major sponsor for the annual United Way Golf Tournament. 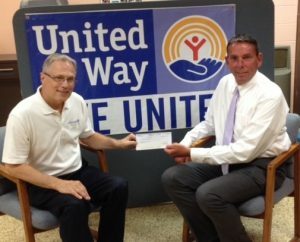 In addition to the donation for United Way’s annual campaign, Dengos presented McGrath with a second check for $2,500 to benefit the annual United Way Golf Tournament. National Grid is one of the major sponsors of this year’s tournament, which will be held July 10 at the Oswego County Club. The tournament will have two flights, 8 a.m. and 2 p.m. and offers a full day of fun for a good cause. The tournament, which is the United Way’s largest fundraiser, will host up to 50 teams and features a four- person team captain and crew format. “We greatly appreciate our continued partnership with National Grid through the annual golf tournament. With companies like National Grid as a major sponsor, it allows us to make the proceeds from our largest fundraising event reach further into the community and help those in need,” added McGrath.